California’s commercial shellfish growers say there’s something fishy going on. Another mysterious fish die-off happened in a southern California harbor last week. Scientists are still trying to figure out what caused six tons of sardines to go belly-up in Ventura. Just six weeks ago something similar happened off Newport Beach. Those sardines tested positive for a neurotoxin caused by algae blooms. Meanwhile, commercial shellfish growers say they’re noticing some strange patterns with the algae as well. Bernard Friedman grows oysters and mussels about a mile off the coast of Santa Barbara. But he says over the last couple years, he says, something has been happening in the water that makes what he does nearly impossible. 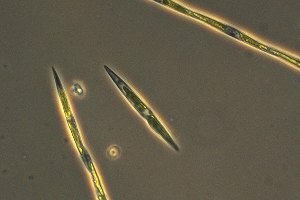 Pseudonitzschia is the type of algae responsible for domoic acid, a neurotoxin. Friedman’s problem is something called domoic acid. It’s a neurotoxin that’s produced by a particular type of algae. When Friedman’s oysters and mussels get hit with a wave of domoic acid, he can’t harvest them, because the shellfish would make his customers sick. Friedman has nothing to sell. He says last year domoic acid cost his business about $30,000. Friedman thinks of himself as a canary in the coal mine, because out there in the ocean, he tends to see problems first. But scientists, like Raphael Kudela, a professor ocean sciences at the University of California, Santa Cruz, are noticing the same thing. So the state takes toxic algae very seriously, with about 50 different testing sites up and down California’s coast. Kudela says this statewide monitoring program is the reason that no one has gotten seriously ill here from shellfish in over half a century, even though they have in other states like Louisiana. But recently, Kudela and others have noticed something rather curious. But about a year and a half ago, that pattern started to change. Kudela says over the last 13 months, pseudonitzchia, the algae that produces domoic acid, has been present in the water almost continuously. “It’s very unusual,” says Kudela. Because of this, and other strange algae patterns up and down the coast, California’s Department of Public Health recently took an unusual step. Authorities issued their annual quarantine on sport-harvested mussels a month earlier than in normal years. And this is not just a California problem. In fact, around the world, algae is growing in places it didn’t used to, at different times of the year than in the past. And what everyone wants to know is: Why? But when you’re talking about the entire ocean, he says, the biology is so complicated that it’s just incredibly hard to tease out causes and effects. Still, there are some theories. One is that increasing amounts of sewage and agricultural waste are seeping into the ocean, making algae grow. And then there’s climate change. The ocean is clearly becoming more acidic, thanks to the increase in carbon dioxide. So it’s not a stretch to wonder what effect warming temperatures could be having on algae. But scientists have only been sampling toxic algae for a few decades. Kudela says there’s just not enough data to make a definitive link between the algae blooms and climate change. Of course, all this speculation about causes isn’t much use to commercial harvesters, like Kevin Lunny, who runs Drakes Bay Oyster Company, out in Point Reyes. He says worrying about toxic algae is part of the job. 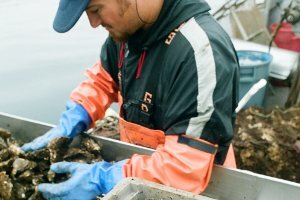 Lunny’s crew tests for toxins at least once a week, first the water, and the meat of the oysters, themselves. Last year, they had to recall an entire shipment. Sometimes, Lunny says he can see the ocean change color, which alerts him to the fact that an algae bloom has entered the bay. But this time, he had no warning at all. Raphael Kudela, at Santa Cruz, says there should be a way to predict when these blooms are coming. By using computer modeling and satellite images, they should be able to give harvesters enough warning that they could pull their products early, before the toxins hit. But that technology is several years away. Bernard Friedman, down in Santa Barbara, says he doesn’t think he can wait that long. A disturbing number of people reported extreme symptoms after May2001 SF Oysterfest, where only DBOC’s oysters were served. The SF Health Department fumbled around before settling on an unconvincing culprit – camphylobacter. Since domoic acid toxin is a fairly recent chronic problem in CA coastal water – this might easily have been overlooked. Prev Toxic Algae on the Loose Next Better Left Unknown?